Now, I was quite busy with my other jobs outside of writing and photography. Even so, I managed to squeeze in some contemplative periods in order to focus on which photos I could pull from my collection for this assignment. Landscape with Water #1 – For my submissions I am starting out small……last summer we had a rubbermaid bin in our yard with some odds and bits of broken things in it. Things destined for the dump. 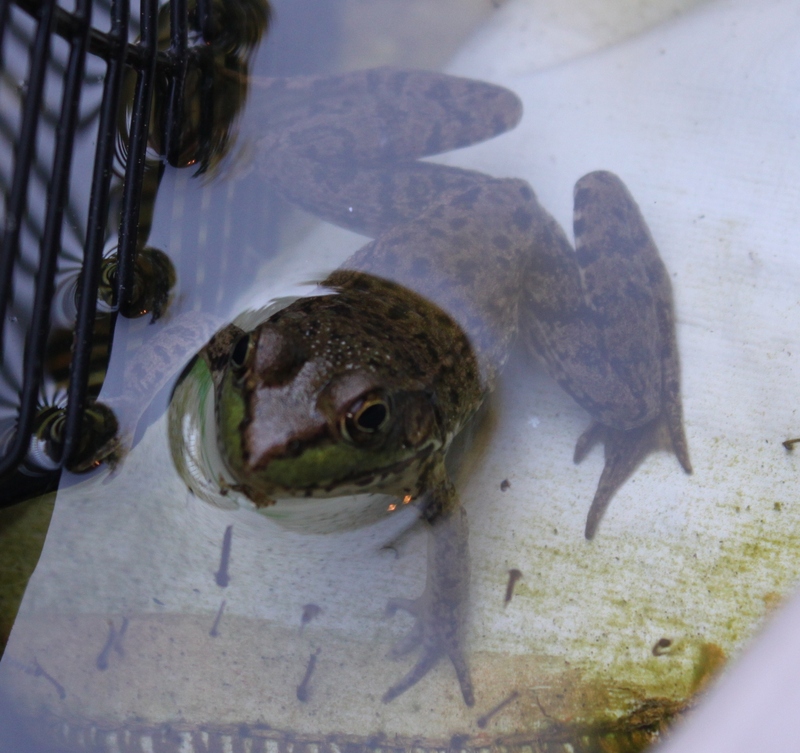 However, one day I looked at the little pile accumulating and noticed not only had the rubbermaid bin collected a sizeable amount of rainwater over a period of time, but the “landscape” had seemed inviting enough for two frogs to make their home there! Landscape is man-made (you can see parts of a fan on the left) and the water is a pond of rainwater. Landscape with Water #2 – For this one I am going completely opposite to the first one…..this time from far up high! Later last summer my husband and I had the opportunity to squeeze in a quick trip out west, so here we are flying above the Rockies….going north for our two-day introductory scoot to the Yukon. You see magnificent Rocky landscape with a big river running through. Unfortunately, it’s hard to get flight staff to tell you EXACTLY where the plane is….. NOTE: When a friend commented on this photo, referring to its “out of the box thinking” perspective, I replied with…..
Landscape with Water #3 – Also from our trip last summer out west….my husband and I decided on a day trip to Skagway – we are Klondike Rush history enthusiasts! – and we didn’t have enough time to drive up to Dawson City (our first choice and for next time). This photo is of Emerald Lake – still in the Yukon, before the border to Alaska. We stopped here to spend some time just taking in the view, and this nifty colouration of the lake intrigued me. It is due to the depth and water particles, etc. that this lake gets its name. You can see the green along the shoreline. Landscape with Water #4 – For this one I go a bit further back into the archives….August of 2011, when my youngest son and I went for a week-long trip to Prince Edward Island – a much-loved place for me! – We spent almost every day at one beach or another; our favourite one was the one closest to where we were staying…..North Rustico Beach. I love the red earth there! It’s everywhere on PEI! And I looked over in the direction of her pointing finger…..
(Note: She told me she had already noticed the frog there on Friday, when she came here to pick up some extra camping gear for her weekend camping/canoeing trip). 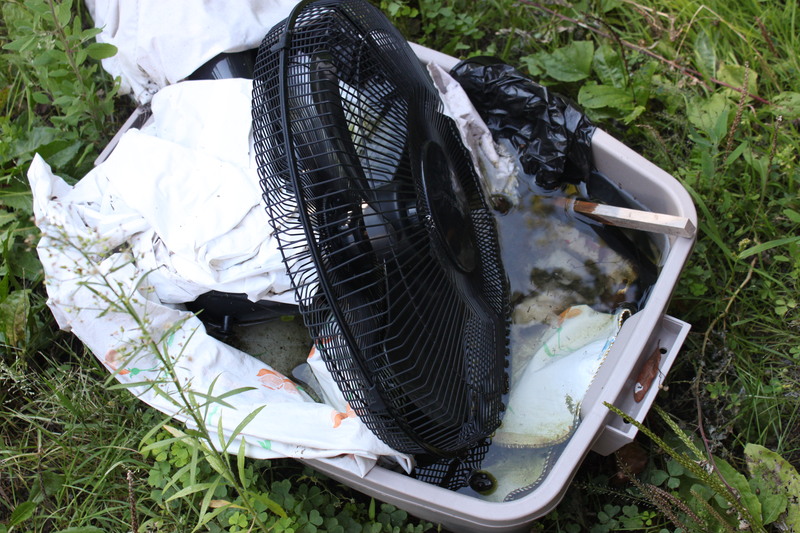 It seems that we have somehow – without trying – created a pond-like habitat in our yard…..a plastic rubbermaid bin holding odds and bits of broken items, meant for the dump. And then a few rain showers later…..voilà! A mini pond! And when I looked closer, sure enough, floating with only his head showing is a little green frog. Well, ain’t that just hunky-dory! So naturally I ran into the house to grab my camera! Hahaha! Nature is so adaptable, and definitely makes good use of when opportunities present themselves. Hmmm…..I like the idea of an amphibian B&B in the garden, considering we usually have to walk down our country road past our two neighbours in order to visit the frogs in the REAL pond. 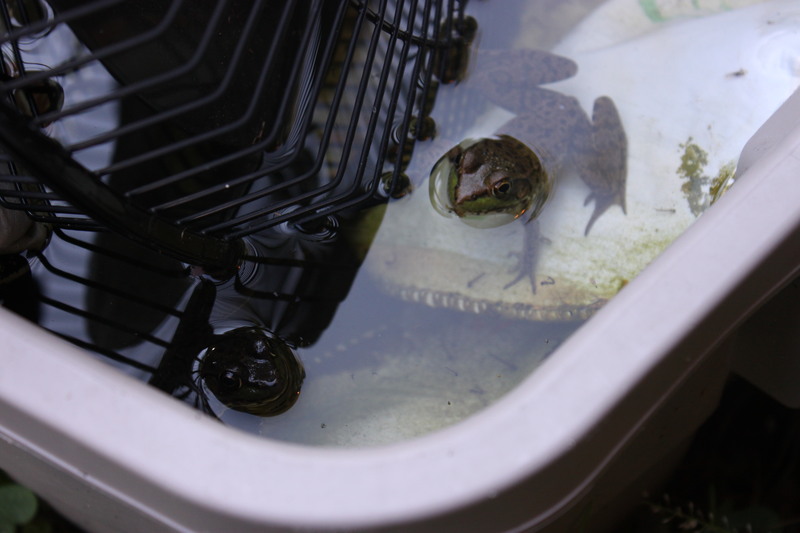 Here is the whole bin in view, and you may be able to make out the one frog near the top and the other one still in the bottom corner.